Your webstore will come loaded with the in-house PSS Webstore Category Structure. You will want to give serious thought to drastically changing this category structure as PSS provides the catalog mapped only to these categories. From the main PSS menu click Webstore > Categories. You will land on a page that has the current category structure of your store. Likely the PSS provided in-house category structure. To add a category simply click "New Category". From here you will select the Parent Category. The Parent Category is the category under which this new category will be nested. Parent Category of None will give you a new Parent Category which will display on the menu bar next to Apparel, Parts, Helmets. Parent Category of Parts will nest your new category under Parts. This will appear next to Exhaust, Handlebars & Control, Tools, etc. Simply click through the categories and use the Delete button. Caution: If you delete a category then all of the products mapped to that category will become unlisted and will no longer appear on your site. Also, be careful deleting top level, parent categories. This will land you on a page that displays every "Product Group" that you have already listed, or that PSS has listed for you. This page gives you some filtering capabilities so that you can easily Delete a product, Feature a product, or Hide the Price of a product. Start by using the filters on the left-hand nav. Filter by the Catalog, Manufacturer Group, or the Listing Status; or a combination of all of them. Once you locate the Product Group(s) that you wish to manipulate simply click on an open area of the row and highlight the row or rows. You can also use the Select All button to work with a page of products at once. Once the row(s) are highlighted simply click the red Delete button at the top. Once the row(s) are highlighted simply click the Quick Edit button at the top. Check the Featured box and hit submit. Once the row(s) are highlighted simply click the Quick Edit button at the top. Leave the Featured box UNCHECKED. Click submit. Once the row(s) are highlighted simply click the Quick Edit button at the top. Check the Price Hidden box and hit submit. To change product pricing for items listed on your webstore you will need to apply a Pricing Rule or a Price Override . PSS has made it very easy for dealers to import vehicle information and have the units display in a cohesive format on the webstore. Once you arrive on the units page you will have multiple options to get vehicles entered. When the vehicles are entered they will automatically arrive in your webstore very quickly. To add the vehicles to your webstore you have three options: Import VIN, Import Range, and Create Vehicle Manually. Below we will cover each option along with all the general functionality of this module. Click the button labeled "Import Vin"
Click Submit. Close the window that pops up. This unit and all of its specifications including a stock image have now been pulled into PSS and pushed to your webstore automatically. If you wish to add/edit images, edit vehicle specifics, edit vehicle pricing, or edit vehicle information, scroll down on this help article to see how these other features function. Click the button labeled "Import Range"
Select the Type of Vehicle, Year, and Make. Check the boxes of the models you want to be imported and then click Submit. Close the window that pops up. These units and all of their specifications including a stock image have now been pulled into PSS and pushed to your webstore automatically. If you wish to add/edit images, edit vehicle specifics, edit vehicle pricing, or edit vehicle information, scroll down on this help article to see how these other features function. Click the button labeled "Create New"
Fill out as much information about the vehicle as you have. Next, you will be taken to the Edit Vehicle Details page where you can input Images, Vehicle Specifics, Vehicle Pricing, and Vehicle Information. These units and all of the specifications that you entered have now been pulled into PSS and pushed to your webstore automatically. If you wish to add/edit images, edit vehicle specifics, edit vehicle pricing, or edit vehicle information, scroll down on this help article to see how these other features function. The features below allow you to manipulate a fair amount of information pertaining to the vehicle units. 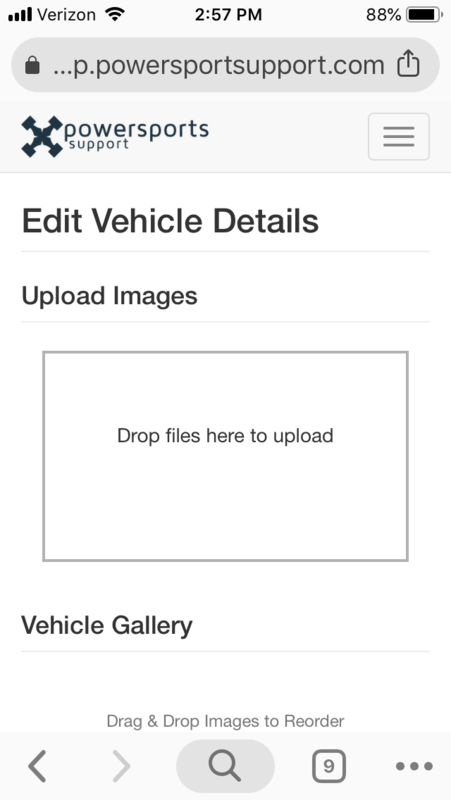 You have the ability to import your own vehicle images and change the order in which they display. Locate the vehicle you wish to add an image to and on the far right click "Edit". Drag the image from your computer files onto the Upload Image Box at the top. By clicking and holding on an image in the Vehicle Gallery you can change the order in which they appear. Make sure to save the order once it is to your liking. 1. Open PSS on your mobile device through its mobile web browser. Chrome, Safari, Firefox, etc. 2. Browse to the Vehicle Unit in question. Click on the Image Box where it says "Drop Files Here"
3. 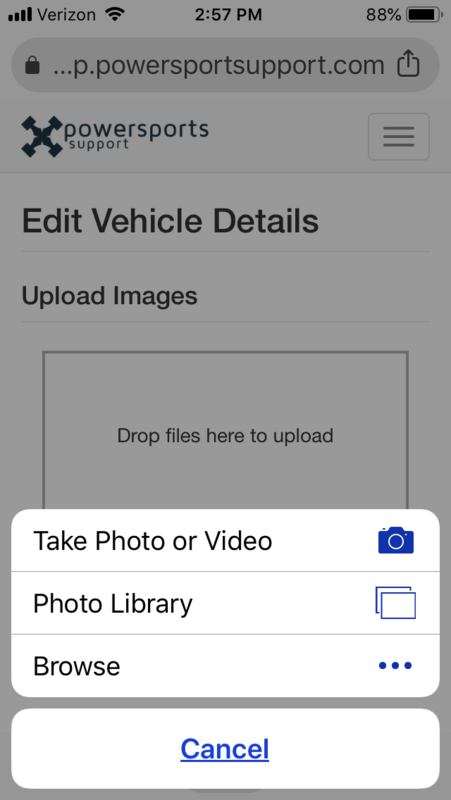 Click "Take Photo or Video" and the "Use"
The photo will upload and be pushed to the vehicle listings on your website without delay. Scroll down to Vehicle Specifics and make your inputs/edits. Check the boxes if you want the vehicle featured on your homepage or hidden from the store. Click Save. The edits will go to the webstore without delay. Scroll down to Vehicle Pricing and make your inputs/edits. You will be given a Short Description Field and a Long Description Field. Use them as you wish. Dealers mainly use this area to type in custom text ranging from financing or sales to vehicle condition and a list of aftermarket parts that the vehicle has on it. 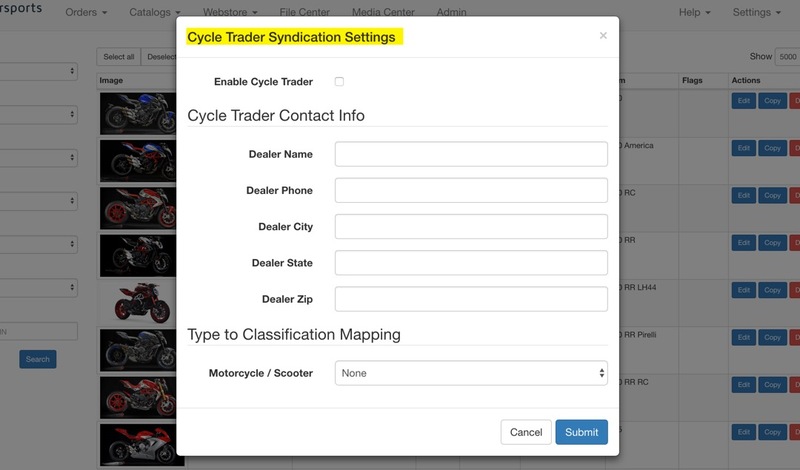 PSS supports the ability for you to push unit inventory to Cycle Trader. PSS supports the ability for your "Apply for Financing" buttons on the unit pages to link out to external forms (Octane Lending, etc). PSS provides you with the ability to pull in Vehicle Pricing from your Lightspeed account as long as Lightspeed 3PA is enabled. 1. Create the Vehicle Listing in PSS by using one of the methods above: Import VIN, Import Range, Manual Creation. 2. In PSS go to Webstore > Units and filter down to the vehicle that you wish to pull in. Highlight the row. 3. Click the Create/Import New button. Then click Import From Lightspeed. On the PSS Webstore front end, visitors to your site will see the Value my Trade in banner/link once they click into each Unit Page. This feature will allow you to exclude entire brands from your Webstore. Another way to remove a brand from your webstore is to go to Webstore > Products, filter by brand "listed" status. Show 1,000. Select All. Delete.